This wide-ranging overview of design in everyday life demonstrates how design shapes our lives in ways most of us would never imagine. 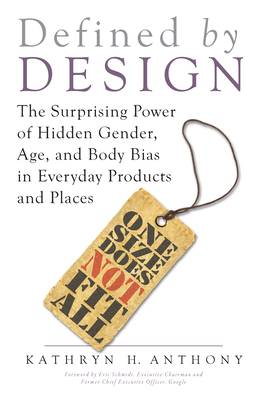 The author, a leading expert in social and psychological issues in design, uncovers the gender, age, and body biases inherent in the designs of common products and living spaces that we all routinely use. From the schools our children attend and the buildings we work in to ill-fitting clothes and one-size-fits-all seating in public transportation, restaurants, and movie theaters, we are surrounded by an artificial environment that can affect our comfort, our self-image, and even our health. Anthony points out the flaws and disadvantages of certain fashions, children's toys, high-tech gadgets, packaging, public transportation, public restrooms, neighborhood layouts, classrooms, workplaces, hospitals, and more. In an increasingly diverse populace where many body types, age groups, and cultures interact, she argues that it's time our environments caught up. This fascinating book--full of aha moments--will teach readers to recognize the hidden biases in certain products and places and to work for more intelligent and healthy design in all areas of life. Kathryn H. Anthony, Ph.D., has been teaching in architecture and design and serving on design juries for over thirty years. She is professor and past chair of the Design Program Faculty at the School of Architecture, University of Illinois at Urbana-Champaign, where she also serves on the faculty of the Department of Gender and Women's Studies and the Department of Landscape Architecture. She is the author of over 100 publications including the award-winning book, Designing for Diversity: Gender, Race, and Ethnicity in the Architectural Profession. She holds the lifetime title of Distinguished Professor of the Association of Collegiate Schools of Architecture (ACSA). Her research and publications have received awards from the ACSA, the American Institute of Architects (AIA), and the Environmental Design Research Association (EDRA). Dr. Anthony has been a spokesperson about design issues on ABC World News with Diane Sawyer, National Public Radio (NPR), CNN.com, the Chicago Tribune, the Economist, the Guardian, the Los Angeles Times, the New York Times, Time.com, the Wall Street Journal, and the Washington Post. She has testified before the US Congress about gender issues in design.